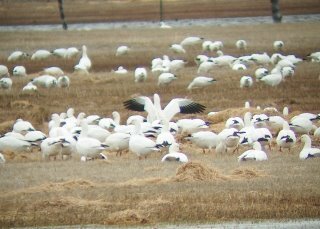 Excellent birding this past weekend (April15-16). 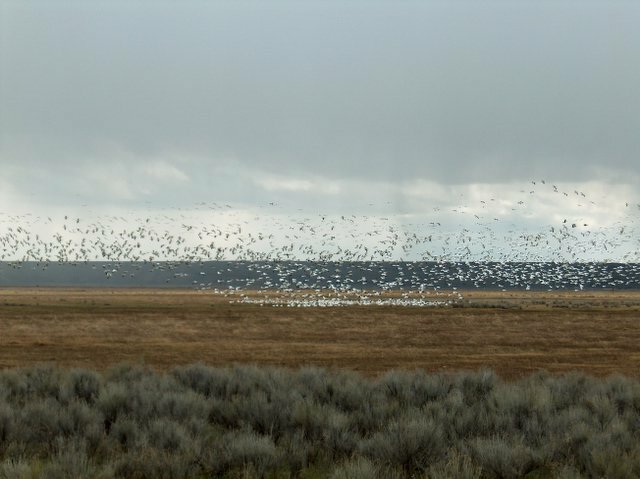 We traveled to the Malheur National Wildlife Refuge in Southeast Oregon to first and foremost view the Snow Geese and Sandhill Crane migration, but also take in the other varied birds traveling through the area. The highlight was clearly the tens of thousands of Snow Geese! 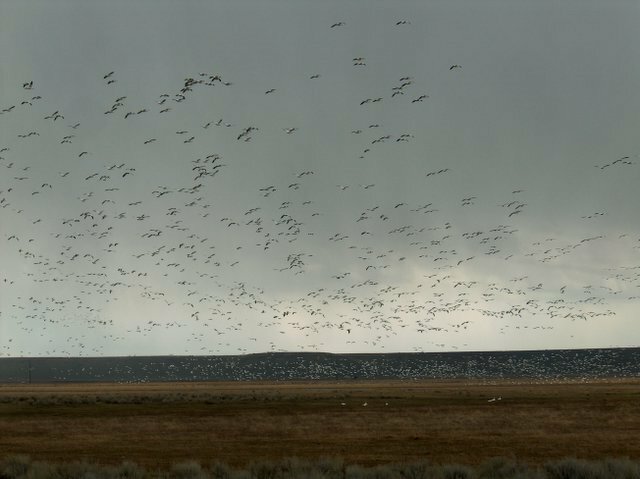 The photos included in this post just don't do justice to the experience of seeing this many birds in flight. 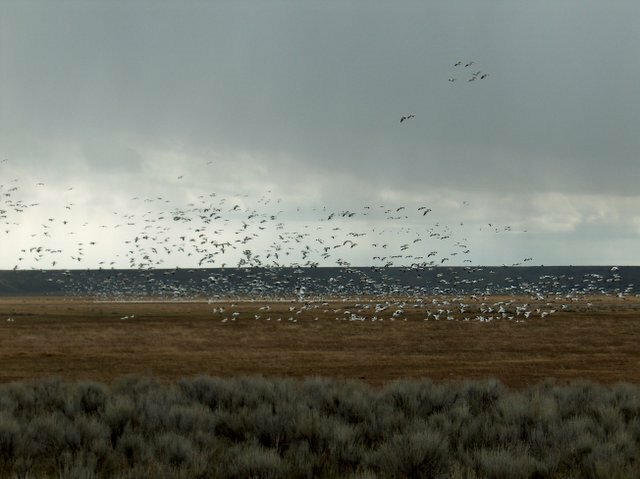 These photos represent one group out of 5 or 6 this size that we saw in the fields South of Burns Oregon. 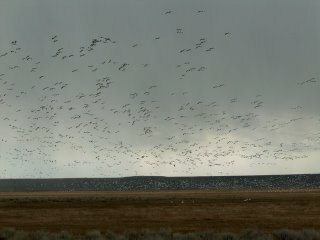 We estimate between 3 and 5 thousand birds in this flock. 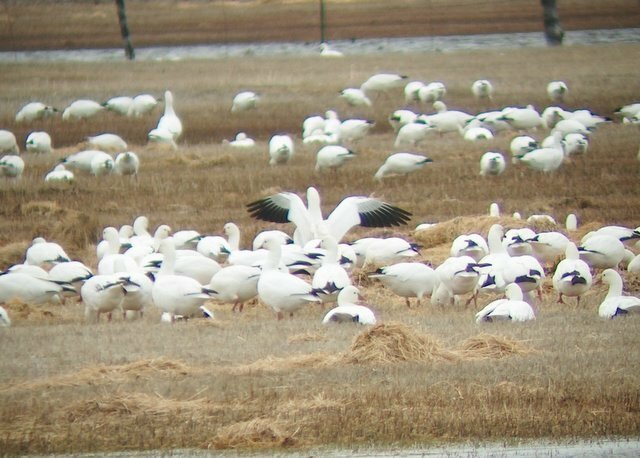 The other flocks were of similar size. We didn't see a lot of Sandhill Cranes, but did see one group of 25 and a few groups of 2 to 3 birds. The refuge itself was nearly deserted. On the 15 mile dirt road through the center of the refuge, we only saw two cars, and they were traveling together. Even the paved roads had such little traffic that it was no problem just stopping in the road to watch a bird. The visitors center of the refuge has a great display of stuffed birds and eggs (I hope they weren't killed for the museum!). More than 50 birds on display. The display helped to confirm our identification of a few of the birds we were less sure about. We were amazed at the number of Northern Harriers we saw. From almost any place in the refuge, if you scanned the horizon, you could find at least one Harrier flying over the marsh. 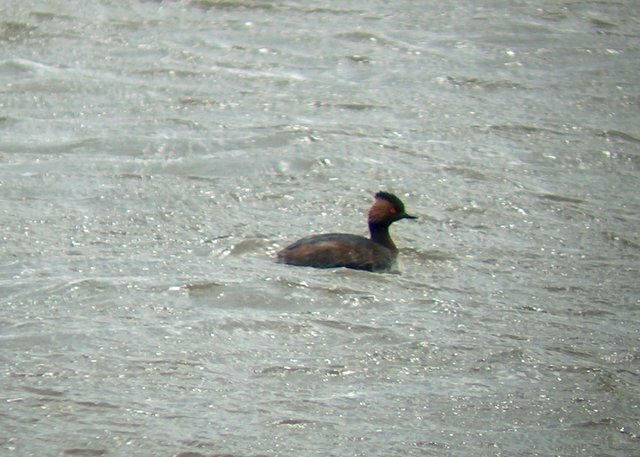 Another highlight of the trip was the viewing of an Eared Grebe. Neither Karyn nor I had ever seen one before. I was able to get this picture through the window of our van since the wind was blowing so hard that my tri-pod and scope would not stand up outside. In all we recorded the identification of 39 bird species. If I was better at identifying small birds, we would have identified many more. We figured we would see more had the wind died down a little. The identified list includes: Eared Grebe, Double-crested Cormorant, Great Blue Heron, Turkey Vulture, Snow Goose, Canada Goose, Mallard, Cinnamon Teal, Northern Pintail, Northern Shoveler, Canvasback, Redhead, Lesser Scaup, Bufflehead, Northern Harrier, Red-tailed Hawk, Golden eagle, American Kestrel, Ring-necked Pheasant, California Quail, American Coot, Sandhill Crane, Killdeer, Black-necked Stilt, American Avocet, Willet, Long-billed Curlew, Franklin's Gull, Forster's Tern, Mourning Dove, Black-billed Magpie, American Crow, Common Raven, Barn Swallow, American Robin, European Starling, Red-winged Blackbird, Yellow-headed Blackbird, and Brewer's Blackbird. 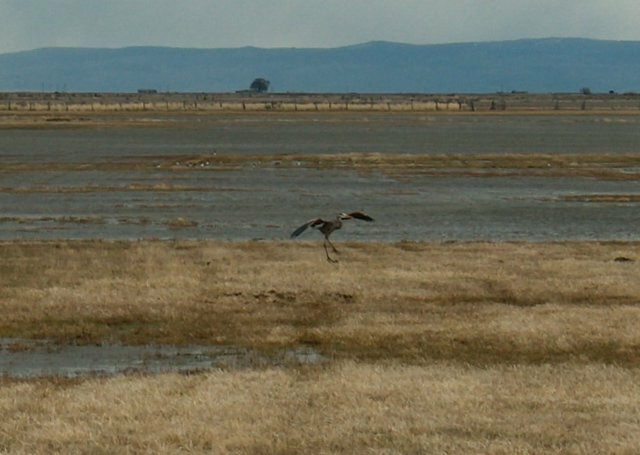 Great Blue Heron coming in for a landing! If you do visit, the hot springs near the town of Crane are very nice.